Panasonic P77 SmartPhone: Panasonic has launched the upgraded version of its P77 smartphone with 16GB ROM at a price of Rs 5,299 exclusively on Flipkart. 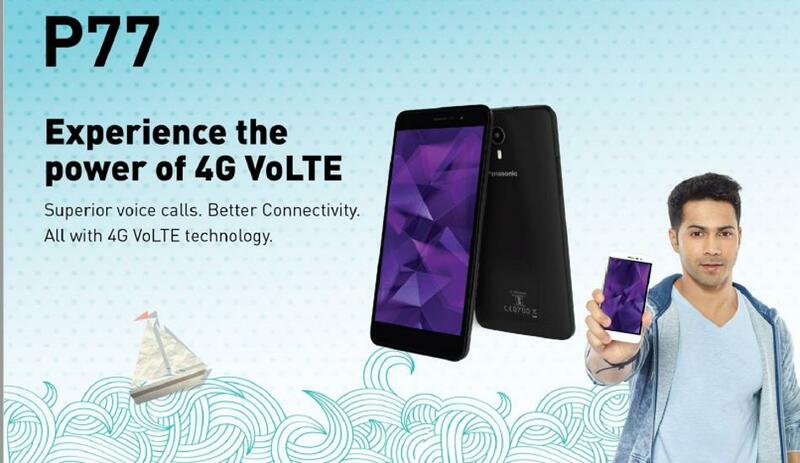 Panasonic P77 comes with 4G and VoLTE support is available in Grey and White color variants. The dual SIM smartphone has a 5-inch HD display with 720 x 1280 pixel resolution. Powering the handset is a 1 GHz Quad-core Processor coupled with 1GB of RAM.It has been upgraded to 16GB of internal storage which can be further expanded up to 32GB via microSD card. The smartphone runs on Android 5.1 Lollipop OS. It features 8MP rear camera with LED flash and a 2MP front-facing camera for selfies. Connectivity options include 4G, LTE, 3G, Wi-Fi, Bluetooth, and GPS. It is backed by a powerful 2000mAh Lithium Polymer Battery. The phone supports 4G VoLTE, dual SIM with 4G/3G and 2G configuration, Wi-Fi Hot Spot, Wi-Fi Direct, Bluetooth and Global Positioning System (A-GPS). Moreover, it supports FM and also comes with a protective screen guard as a free accessory.